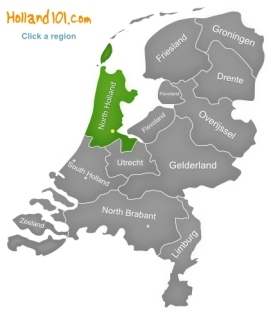 North Holland is the home of Amsterdam, most likely the most famous city in Holland. The region itself is not very huge, and can easily be explored within a couple of days. 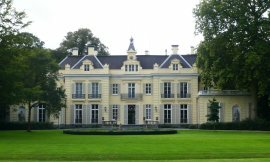 It is a great place for people who like being close to the water because the region is basically surrounded by water (the North Sea to the West, and the Ijsselmeer to the East), and there are also many canals all over the region. This can turn navigation into a bit of a problem because it's often not possible to just go from one place to the other in a straight line because you'll have to find a place where you can cross the canals! North Holland is the region of cheese, sandy beaches and windmills. It's definitely the kind of Holland you expect from postcards and picture-books. Some of the little villages almost feel like they are part of a museum because it is so easy to feel like you are taking a step back into the past. While Amsterdam is the biggest city of North Holland, and also the most famous one, the actual capital of North Holland is the city of Haarlem, and it's worth a visit even though most people always head straight to Amsterdam. Haarlem is also only a short ride away from Amsterdam, so there's really no excuse on missing out. 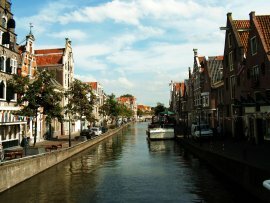 Haarlem is a very beautiful city along a river, and boasts plenty of historical buildings. It is lovely if you walk along the river during the early morning hours or late in the afternoon when the light hits the buildings along the river the right way and you can see their reflections on the calm waters. Haarlem is also a very important city for the flower bulbs trade, so you will most likely also be able to see lots of plants in certain areas. 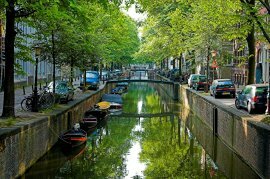 Even though Amsterdam has a reputation for being quite tolerant when it comes to drugs, and is also famous for its red light district, it is a fairly place safe to visit as long as you keep out of the dodgier parts of the city. Amsterdam is very popular with tourists, and the largest airport of Holland is not far away. The city is often called “Venice of the North” because of its many canals, and a trip on the canals – or a walk along them – is definitely something you shouldn't miss while you are in Amsterdam. The Amsterdam canal ring can also be explored by biking along-side it, and on a bike you'll get to see more in a shorter time, but the classic thing to do it to take a trip on a tourist boat or hire your own! The Rijksmuseum is the largest museum in Holland, and known world-wide for its fantastic collections. About a million visitors come to the museum every year, so be prepared for it to be quite busy. Another place for art lovers is the Van Gogh museum which doesn't only hold pictures and sketches but also letters. The National Maritime museum is also a great place to visit. They have a 17th century ship, and inside the museum, you can learn more about the importance of the sea and ships for Holland as a country. The Magere Brug is a place to go if you would like to see a Dutch draw-bridge in action. You won't have to wait long as the bridge is usually used every 20 minutes. The bridge was built in 1670, and is a good example of how something from the past can still work perfectly well in our modern world. If you like cheese, then the name Edam might be familiar to you. This city is the original source of the Edam cheese, and it also worth a visit because of its lovely old city core which is protected by the government, and a great example of what old city centres looked like in the past. While we are talking about cheese, there's no way around Alkmaar, the capital of cheese in Holland. Many tourists visit Alkmaar simply because of cheese, and once you are there, you most likely won't be able to escape the cheese! It's almost everywhere, and there's no mercy for dairy-intolerant people. However, there is also a lot to see if you are interested in a more cultural and historic side. The old city centre is lovely for a wonderful walk, and apart from historic buildings, you can also visit some educational museums that will teach you more about the heritage of Alkmaar.